Daniel has given many years of faithful service to Queen and country. 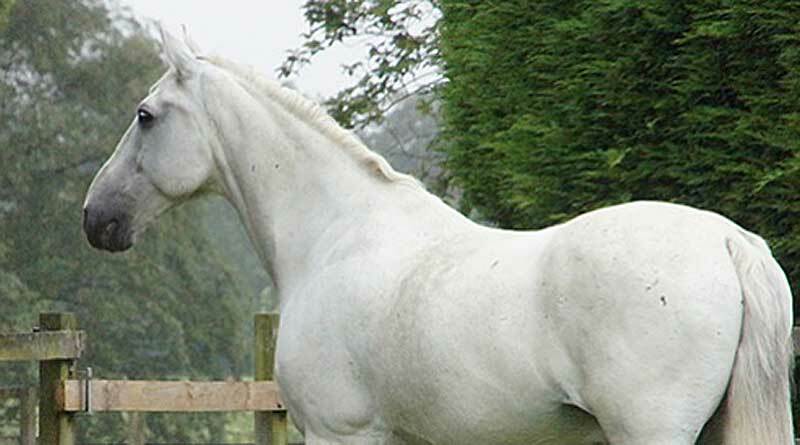 An elegant Windsor Grey named Daniel has stepped into retirement with The Horse Trust in Britain after 14 years of service with the Royal Mews. Daniel has joined fellow Royal Mews veterans Flint, Marsa, and Big Tom at the Horse Trust’s Home of Rest for Horses in Buckinghamshire, where he will quickly leave the rigours of duty behind him. Daniel was very much a poster boy for the mews, serving as a harness horse for the Queen’s carriages. He took part in many events including state visits, the state opening of parliament, the Queen’s birthday parade, the Garter service at Windsor Castle and conveying the Queen’s Body Guard to the palace for investitures. Daniel started his career with the Metropolitan Police before transferring to The Royal Mews. In 2014 Daniel, at right, featured on a Royal Mail postage stamp in a series featuring working horses, in what was also the Year of the Horse. One of his regular duties was to convey newly appointed high commissioners and foreign ambassadors to present their credentials to the Queen at Buckingham Palace. Windsor Greys and Cleveland Bays have drawn carriages for the Royal Family since the reign of Queen Victoria, as well providing the postal service as “the daily messenger”, setting out from the Royal Mews to collect and deliver post between Buckingham Palace and St James’s Palace. In addition to his ceremonial workload Daniel became something of a celebrity in the Royal Mews with his picture appearing in the official souvenir guide as well as featuring on a 2014 stamp collection by the Royal Mail commemorating Britain’s working horses. In that same year, he and his stable mate Storm were immortalised in a life-size statue situated on the Peanut roundabout in Windsor. The artwork was commissioned by residents who had taken up a charitable collection to celebrate the Queen’s Diamond Jubilee. Trust chief executive Jeanette Allen said it was a privilege to provide a tranquil retirement for horses and ponies who have served Britain. “Horses working at The Royal Mews belong to the nation and not, as many believe, to the Royal Family; and so, these magnificent animals who have made the nation so proud on ceremonial occasions seen around the world are as welcome here as the horses that have served in the military or police,” she said.